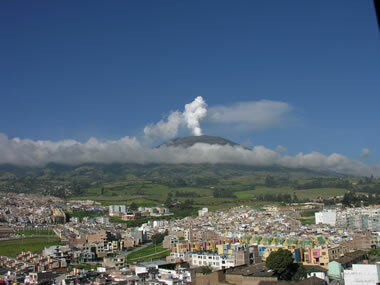 Photograph of Galeras Volcano taken from the community of Pasto, Colombia on December 30, 2005 by José Camilo Martínez. 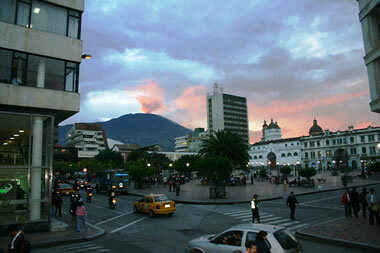 Pasto has a population of over 300,000 people and would be at risk if a major eruption occurred at Galeras. Creative Commons License. Enlarge image. Galeras, a stratovolcano in the southwestern part of Colombia, is one of the South American country's most active volcanoes. Historic records of eruptions at Galeras date back to the 16th century, and the active cone is part of a volcanic complex that has been erupting for more than one million years. Galeras is only a few kilometers from the city of Pasto, and poses an immediate threat to the more than 300,000 people who live there. Plate tectonics of Galeras volcano: Simplified plate tectonics cross-section showing the subducting Nazca Plate providing magma that feeds the eruption of Galeras Volcano. Galeras volcano map: Map showing the location of Galeras Volcano in southwestern Colombia. Line A-B marks the location of the plate tectonics cross-section on this page. Map by Geology.com and MapResources. The Galeras volcanic complex is located in the Colombian segment of the South American Andes mountains. The Andes in Colombia are the result of a collision between the Panamanian tectonic block with South America, which detached part of the South America plate from the continent. This segment was pushed northward and upward, and this thrusting (in addition to the subduction of part of the Nazca plate under the Colombian block) created the Northern Andes. 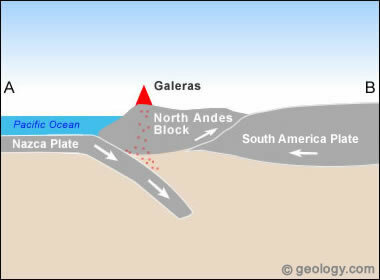 Galeras is located near a northwest-dipping thrust fault zone that resulted from this collision. Galeras Volcano from Pasto: A view of Galeras Volcano from the community of Pasto, Colombia - October 23, 2007. Public domain photo by Henry Ernesto Escobar Meneses. Enlarge image. Galeras is an andesitic stratovolcano that is part of an older volcanic complex. The active cone of the volcano, which has grown in a large horseshoe-shaped caldera created by a large edifice collapse, has been erupting for the past 4,500 years, but the volcanic complex has been active for more than a million years. Recently, eruptions at Galeras have been characterized by Vulcanian explosions, pyroclastic flows, degassing (especially of sulfur dioxide), and ash plumes. 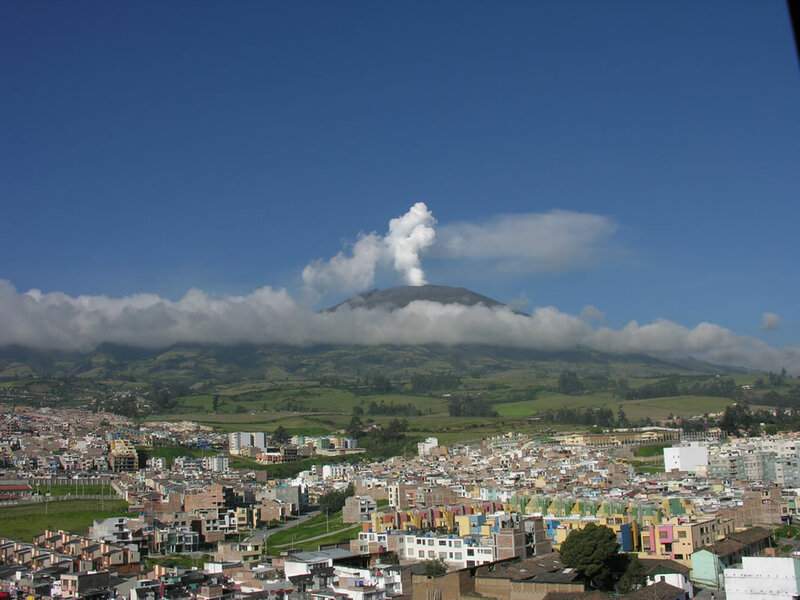 All of these types of activity are immediately hazardous to those who live near the volcano; pyroclastic flows are especially a concern, as many people who live in Pasto do not heed evacuation warnings issued by local scientists. In addition to the hazards posed by volcanic activity, debris avalanches are also a major concern at Galeras. The volcano has areas of extensive hydrothermal alteration, which weakens rock and makes it more prone to collapsing. Such collapses have occurred on at least three occasions, producing large debris avalanches which have swept down the flanks of the volcanic complex. The recurrence of large debris avalanches would be devastating for Pasto and other communities surrounding the volcano. Galeras Volcano Aerial View: Aerial view of the Galeras summit taken in 1989. USGS photo by Norm Banks. Enlarge image. -- Seismic activity at Galeras has displayed characteristic signals known as "tornillos." "Tornillo" is Spanish for "screw," and these seismic signals are so named because their shape on a seismograph resembles a screw with a wide head and tapered tail. At Galeras, these signals are generally regarded as short-term precursors to explosive eruptions. 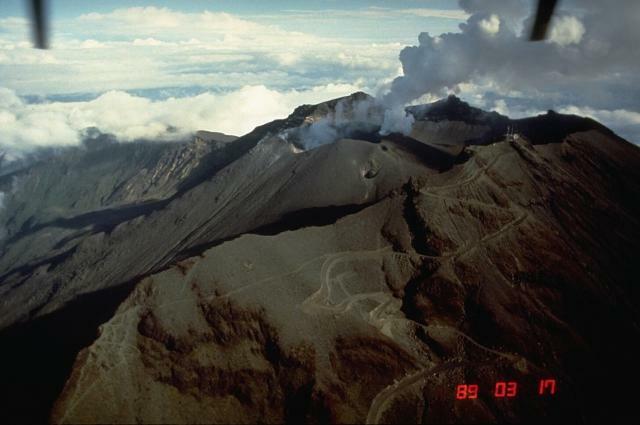 -- In 1993, Galeras erupted with no warning (seismic precursors) while a group of volcanologists and visitors were visiting the crater of the active cone. Nine people were killed and six were injured in the explosion; because of the lack of seismic activity, many of the victims were not wearing adequate safety equipment. The disaster served as a cautionary example to other volcanologists, and now many are much more wary of venturing into an active volcanic crater. The Galeras volcanic complex is more than one million years old; its history has included caldera-forming eruptions, summit collapses, and stratocone-building activity. The first caldera-forming eruption occurred ~560,000 years ago, after 200,000 years of other eruptive activity, and produced a 5-km-wide crater and huge pyroclastic flows which inundated the area around the complex. Another caldera-forming event ~40,000 years ago occurred near the rim of the earlier crater. Between 12,000 and 5,000 years ago, several edifice collapses occurred because of hydrothermal alteration of the volcanic complex; one of these created the breach in the caldera in which the active stratocone now sits. The active cone began growing 4,500 years ago, and its eruptive style has been characterized by relatively small Vulcanian explosions. Historical records of these eruptions date back to 1535, and periods of activity have occurred every few decades since that time. Recent eruptions have been more frequent, and in the last few decades have been characterized by lava dome extrusion and explosions from the central vent of the cone, accompanied by persistent seismic activity. Smithsonian Institution Global Volcanism Program Website: Galeras page. Servicio Geologico Colombiano: Observatorio Vulcanologico y Sismologico Pasto: Volcán Galeras - Generalidades (in Spanish). The Volcanism Blog, Galeras eruption coverage. Baxter, P. and Gresham, A., 1997, Deaths and injuries in the eruption of Galeras Volcano, Colombia, 14 January 1993. Journal of Volcanology and Geothermal Research, v. 77, p. 325-338. Calvache, M.L., Cortes, G.P., Williams, S.N., 1997, Stratigraphy and chronology of the Galeras volcanic complex, Colombia. Journal of Volcanology and Geothermal Research, v. 77, p. 5-19. Gates, A.E. and Ritchie, D., 2007, Encyclopedia of Earthquakes and Volcanoes, Third Edition: New York, NY, Checkmark Books, 346 p.
Gomez, D.M., Torres, R.A., Seidl, D., Hellweg, M., Rademacher, H., 1999, Tornillo seismic events at Galeras volcano, Colombia: a summary and new information from broadband three-component measurements. Annali di Geofisica, v. 42, no. 3, p. 365-378.